it never turns to be the rose of your dreams. Knowing how to plant roses whether seeds or stems can be a rewarding thing. Most people may be having a general idea of how to plant these flowers. You can obtain the seed or plant that you love, the dirt and a pot or dig a small hole for the plant or seed to be put into. You can then water the cutting or seed to hydrate it and then wait for the outcomes. Of course, there might be many other processes that you need to consider when planting. You should ensure that the soil is suitable to provide as well as sustain nourishment for the seed or cutting to grow, by adding some fertilizer to the soil. You should occasionally weed your plants and also be watering them regularly is extremely important. While planting rose seeds, you will be required to strip the seeds from the hips as well as removing the pithy covering, and then place into a jar full of sand. You can arrange them in different ways, for example, a layer of seeds, followed by a layer of sand, then another one of seeds, etc. After that, you need to cover the top the jar using a lid, and then put it in the fridge for about eight to twelve weeks. Once you see the primary signs of spring are in the air, you will need to plant your seeds into a cold frame, preferably you can use individual peat pots. After some few weeks, you will see your first roses starting to sprout. These sprouts are vulnerable over the first days, but since prevention is better than cure, always utilize clean pots, with the right seed starting mix, you should not over water or even overcrowd them. You can also spray them with seaweed extract. 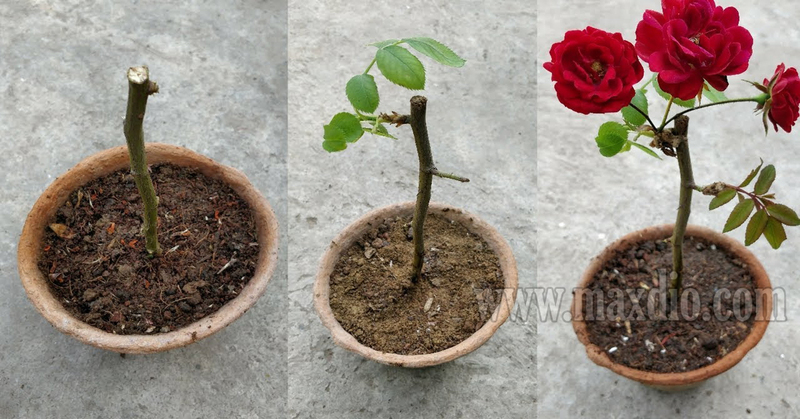 You can also use rose stems which the most commonly used technique for growing roses. You should cut the stem from the side part or upper part of the plant for growing needs. The stem should be four to six inches in its length, should have some leaves and should be precise for it to grow as expected after planting them. It is important to make a cut at an angle of forty-five degrees. The ideal type stem is the one made below the leaf node. You should first prepare the stem prior to planting by removing buds, leaves, and flowers to enable the plant to use most of its energy in developing roots. You should place the stem in a solution of root hormone to help your plant have better growth. You can use a plastic bottle without a bottom or even a quart-size jar to grow the stems. Place the stem in the soil and then pull the plastic bottle or jar over it. You will be required to water the soil around the jar periodically to prevent the stem from drying out. After some few months, the stem will develop some roots and it will start to produce leaves. Remember rose plants doesn’t do well in environments with extreme temperatures below thirty-two degrees and above a hundred degrees. It is important to ensure that you maintain the right temperatures for the plant growth. These stems should always be kept moist, with proper air circulation and where sunlight falls on them. Ensure that you make necessary slits usually at the bottom of the cutting to ensure proper rooting of the plant.